Reclaiming yarn from old sweaters and other previously crafted items is a great way to obtain yarn for new projects. I was lucky and got a free crocheted vest at my local thrift store. The yarn was in good condition but the vest wasn’t the best looking item. So I unraveled the vest and got this pretty oatmeal yarn with little specks of color throughout it. Because it was a vest, there wasn’t a lot of yarn so I added some green worst weight yarn to compliment this round ripple. Reclaiming yarn from thrift store sweaters is a wonderful and frugal way to get some very nice yarn at a terrific price. I’m always on the lookout for great deals on sweaters that I can unravel the yarn. You have to make sure you get the right type of seams otherwise the sweater won’t unravel properly making it difficult to reclaim the yarn. There are several excellent resources on the Internet where seams that can be unraveled easily are shown. Most importantly the bad type of seams are shown so you can avoid those sweaters as there is nothing more frustrating than trying to unravel a sweater when it’s unravel-able. 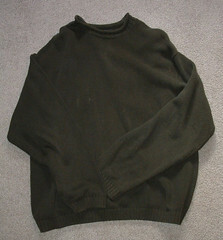 Here is a link to an outstanding post that shows detailed pictures of the seams and how to unravel sweaters. Here is my latest thrift store sweater that I got for a dollar. It had a new stains but otherwise was an outstanding candidate for me to reclaim the yarn. It’s 100% cotton and was an extra large men’s sweater so it contains lots of yarn. Cotton yarn is something that I use frequently and it’s very versatile. I can make baby blankets, dishcloths, baby bibs, hotpads, potholders, placemats, rugs, totes, and purses from the recycled sweater I unraveled. Here is a up-close photo of the seam. If you look closely you can see that the seam doesn’t have a serged edge. I have marked the stitching of the seam in the photo. The stitching is what you want to use a seam ripper to remove so you can open the seam and separate the pieces for unraveling. You want to avoid edges that are serged as the piece won’t unravel. Click to supersize the photo if you want to see a closeup. 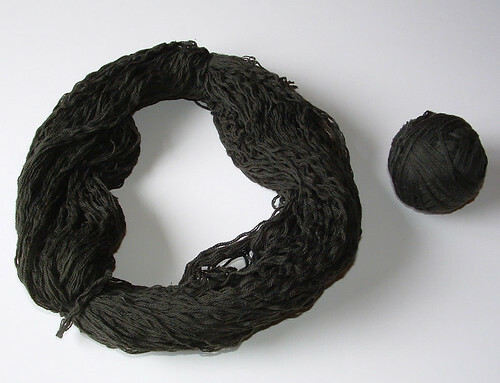 I wrap the reclaimed yarn in a hank form for washing as shown here. Once I have it in a hank form with a few ties to hold it in place, I gently wash and rinse it in the sink. Then I hang it to dry so my reclaimed yarn is clean and fresh smelling. And because I like balls of yarn, here is one sleeve that I wound into a ball after washing and drying. Now I just need to finish unraveling the rest of the sweater and decide on a project or two for the recycled yarn. I’m thinking about using some of the reclaimed yarn for dishcloths and because the yarn is so soft, I plan to use some it for a baby blanket. With the cost of cotton rising these days, it seems reclaiming yarn is not only a green thing to do but also very frugal. I hope you have found this post informative and if you find yourself strapped for money or yarn that you consider reclaiming yarn. As always, happy crafting to all. In honor of Valentine’s Day, I crocheted this heart hotpad from reclaimed yarn. I scored a free cotton/ramie red vest from my local thrift store. It had a hole in it and they had it in their free area so I gladly took it home and unraveled it. It yielded 3 nice balls of red yarn. 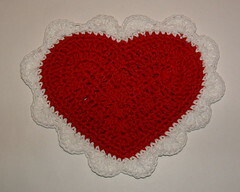 I used Rachel’s free sweetheart Valentine heart pattern over at Crochet Spot to create my hotpad. I followed the posted pattern but added an extra round of single crochet by repeating round 4 twice. I crocheted two red hearts and then put them back to back for a double layered heart hotpad. I finished off my hotpad by working a round of single crochet around and through the double layers with a contrasting white cotton yarn. I then worked the final round as outlined in the pattern to create the scalloped edging. Wishing everyone a wonderful Valentine’s Day and as always happy crafting! Here are my two latest baby afghans that I crocheted for the NICU Baby Blanket drive. 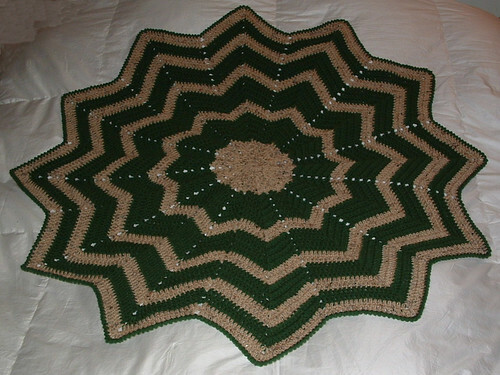 The first is a round ripple afghan that I crocheted using reclaimed yarn from a thrift store sweater. The white cotton yarn was from a thrift store yarn cone I picked up. Here is a before picture of the sweater and then a picture of one of the balls of reclaimed yarn I got from unraveling this thrift store sweater. My baby RR measures 36 inches across and I still have leftover yarn from the unraveled sweater for another project. I found reclaiming the yarn from this old cotton sweater fairly easy and very rewarding to create something new and useful. Next is a starghan baby blanket I crocheted using some worst yarn from my stash. I had some issues with this pattern and it does not lay completely flat but still turned out okay. Recycling thrift store sweaters is a great way to reclaim some nice yarn at a reasonable price. I recently picked up this mohair blend sweater from my local thrift store with high hopes to unravel the yarn. Well I soon found out that this sweater didn’t want to unravel and appears to be an interlocked knit. I put on my thinking cap in an effort to upcycle this old sweater into some new and useful items. First I used the lower portion of the sweater to create a scarf cowl. Using some scrap yarn, I added two rows of single crochet along the lower edges to finish off the raw edges where the sweater body had been attached. My upcycled cowl was finished off with some wooden buttons from my stash. Next I tackled using the sleeve as a plastic bag holder. The natural cuff on the sweater was perfect for transforming the sleeve into a handy bag keeper. As shown in the pictures, I folded under the top of the sleeve to the inside. Using a basting stitch, I sewed around the top edge about 1 inch from the top to create a casing for the ribbon tie closure. I machine stitched the basting to hold the fold in place and also so I could crochet in a straight line to create my casing. I left the back of the casing open where the sleeve seam is. Then using a small D crochet hook and some scrap brown yarn, I worked a slip stitch over the basting and through both layers to create my casing for the ribbon tie closure. See photos below and you can click on any other them to enlarge the pictures. I added a hook hanger at the back by chaining the length I wanted and then worked back down the chain by working a single crochet stitch around the chain and attached both ends into the back of the bag keeper. I threaded a piece of ribbon through the casing and tied it at the back with a bow to complete the plastic bag keeper. I present the upcycled thrift store sleeve which has been transformed into a plastic bag holder.